Our products are inspected strictly by regular tests, and the self-inspections are implemented for product reliability. The methods of self-inspection and regulations of safety standard are databased for further reference as well, that help our products pass the various tests with excellent performance. And the high quality of products and customized service win the reputations among customers. Qualifications obtained for ISO9001: 2008, ISO9001: 2015, INOR, CCC, Dorel SQA, and WM-FCCA, etc. 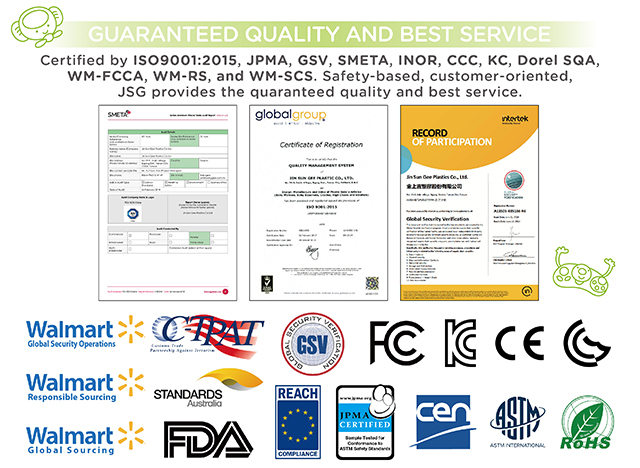 JSG's factory audits are executed by the authorized inspection organization, and we successfully certified by SMETA, WM-RS, and WM-SCS. expedite clearance of goods and reduce delays.